Ant-Man and the Wasp. That look when you learn a Supreme Court appointee is for life. Ant-Man and the Wasp. Based on my many overlong, one-note lamentations about the Marvel Cinematic Universe and its unchecked consumption of cinema, one might reasonably expect that: 1) I wouldn't particularly look forward to the prospect of another installment, regardless of the hero, but also 2) the return of Paul Rudd's Ant-Man/Scott Lang might incur at least a little less of my scorn than the others. Excellent observations, both. Ant-Man (2015), despite a production defined in the early stages by the departure of a director (Edgar Wright) with the potential of creating a more individualized space within the MCU, succeeded at least in taking itself less seriously than most of the rest. While undeniably over-shadowed (and probably over-burdened) by the imagined influence of Wright, Ant-Man found more warmth and fun in the material than most of its counterparts. It (credit to director Peyton Reed) cultivated an air of comic adventure that, if saccharine and a little forgettable, at least side-steps some of the traps the other, larger Marvel movies have laid for themselves, sanctimoniousness and pretension to high art being among the more dangerous and damaging. Ant-Man and now Ant-Man and the Wasp, which Reed also directed, cannot reverse my opinion of all these franchises within a franchise. Nor, on their own merits, are they perfect. But they succeed in the relative simplicity of their intent: they are smaller, airier, happier stories told with warmth and humor. They seem to embrace the notion that it's OK for a movie — a comic book movie, lest we forget — to be fun; some days that's enough. 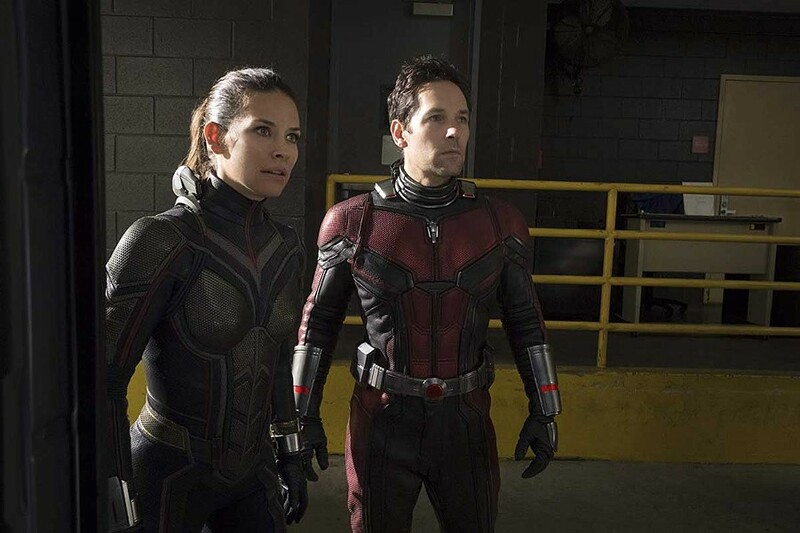 Nearly two full years after the events of Captain America: Civil War (2016), which saw Ant-Man break ranks with Hank Pym (Michael Douglas) and Hope Van Dyne (Evangeline Lilly) to participate in the titular dust-up, he, Ant-Man/Scott Lang nears the end of his two-year house arrest sentence. Meanwhile, in flashback, we learn that Hank's better half, Janet Van Dyne (Michelle Pfeiffer) sacrificed herself for the greater good, shrinking to sub-atomic size and becoming lost in the quantum realm. Scott has some previous experience in that territory, which could prove invaluable to Hank and Hope, who have been working tirelessly and in secret to establish a conduit to it. Their clandestine efforts have been largely supported by an uneasy partnership with black market tech dealer/restaurateur Sonny Burch (Walton Goggins), who has lately gotten wise to the potential value of the father and daughter's innovation to some of his less ethically inclined clientele. Throw into the mix a quantum shifting ex-super soldier (Hannah John-Kamen) and one of Hank's former associates (Laurence Fishburne), bumbling federal agents (led by Randall Park, he of the perfect comic timing), and Scott's cohort of struggling security "experts" (Michael Peña, Tip "T.I." Harris and David Dastmalchian) and you've got the potential for disastrous chaos. Reed, directing a screenplay with too many names attached to it, manages to adequately rein in all the disparate elements, and so the movie retains a sense of lightness and intention in spite of itself. It loses a bit of its momentum to the simple fact that there isn't really a proper villain in the piece, beyond the various circumstances in which the myriad characters find themselves. Even if its narrative can at times feel fractured and distracting, despite its ostensible simplicity, Ant-Man and the Wasp stays focused on the enjoyable aspects of the costume hero genre. It delivers original action sequences, immersive effects and enough danger to remain compelling, all with a big old goofy grin. Is it innocuous? Sure. Flawed? You bet, but it's FUN, and that goes a long way. PG-13. 125M. BROADWAY. FORTUNA. MILL CREEK. MINOR. The Legacy of a Whitetail Deer Hunter. Jody Hill came up with David Gordon Green, Danny McBride and Ben Best, and has done his most engaging, approachable work when collaborating with them behind the camera. The TV series Eastbound and Down makes perhaps the best example, where Hill's tendency toward the humor of bleakness was tempered by McBride's innate sweetness and Green's kooky, latent humanism. When he's gone solo (Observe and Report, 2009), Hill tends to push the funny past the confrontational and into the desolate. I get the impulse, and it remains clear that he and his cast were all in on the joke, but from the other side of the screen the discomfiture quickly leads to disconnection, bemusement to disgust. So I was cautious when approaching Hill's latest, a Netflix original he directed and co-wrote with McBride and John Carcieri. Josh Brolin plays Buck Ferguson, the deerslayer of the title, who has risen to a certain brand of fame through his travelogue hunting videos, lensed by his constant collaborator Don (McBride). Two years after a sudden divorce, Buck feels the need to bond with his 12-year-old son Jaden (Montana Jordan) and alleviate some of his would-be stepfather Greg's (Scoot McNairy) influence. He plans a multi-day hunting trip into the wilds of their home state; the bonding process proceeds less smoothly than he had hoped, with matters becoming increasingly complicated as the days progress. The tone of Legacy slips and skips occasionally, veering from winking parody into earnest adventure, but to me it's easily enough forgiven for that. It's a simple story but told effectively, with enough of McBride's trademark hard-R asides to stay buoyant. And it's nice to see Brolin taking on a role that doesn't require green screens or half-days in the makeup chair. TV-14. 83m. NETFLIX. NAUSICAÄ OF THE VALLEY OF THE WIND. Haruo Miyazaki's adaptation of a manga tale featuring a princess attempting to save a jungle from evil insects in a post-apocalyptic world. Considering the times, maybe this isn't escapism, but this critically acclaimed classic is a great one for the kids. PG. 117m. MINOR. SKYSCRAPER. So, is Duane "The Rock" Johnson going to live up to his potential and deliver a nuanced portrait of a veteran amputee trying to support his family or is he going to jump off a tall burning building while being shot at by bad guys? Oh, both? OK then. Neve Campbell also stars. PG-13. 102m. BROADWAY. FORTUNA. MILL CREEK. SUMMER 1993. This multi-award winner set in rural Catalonia is a memoir of debut director Carla Simon's childhood, who was orphaned at 6 and folded into the family of her aunt and uncle. Child actor Laia Artigas shines in what appears to be a standout cast. Bring your tissues. NR. 97m. MINOR. TOP GUN. Whooooooosh! Phew! Fffffffffft! Yeehaw! Eject, eject! Starring Tom Cruise as "Maverick," this 1986 classic features some of the best dogfights and worst dialogue ever to hit the big screen. PG. 110m. BROADWAY. THE FIRST PURGE. Horror franchise prequel in case you need to be reminded what happens when we elect leadership to "shake things up." BROADWAY. FORTUNA. MILL CREEK. HEARTS BEAT LOUD. Nick Offerman stars as a dad dragging his reluctant daughter (Kiersy Clemons) into forming a band with him. PG13. 97m. MINIPLEX. THE INCREDIBLES 2. This fun, clever and funny sequel is worth the wait, with the returning cast and the right villains for our times. Craig T. Nelson and Holly Hunter. PG. 118m. BROADWAY. FORTUNA. MILL CREEK. JURASSIC WORLD: FALLEN KINGDOM. Nodding to its predecessors and balancing humor, horror and heart, this dino sequel is more than a big, dumb blockbuster. PG13. 128m. BROADWAY. FORTUNA. MILL CREEK. MOUNTAIN. Narration by Willem Dafoe. A score by the Australian Chamber Orchestra. Dizzying shots of some of the world's highest peaks and the people who climb them. Worth seeing on the big-screen, yeah? This is the second documentary by director Jennifer Peedom (Sherpa, 2015). PG. 74m. MINIPLEX. OCEAN'S 8. Sandra Bullock and Cate Blanchett lead an all-star team of cool lady crooks on a heist at the Met Gala in this slower but still fun spin-off. PG13. 110m. BROADWAY. MILL CREEK. SICARIO: DAY OF THE SOLDADO. Director Stefano Sollima gradually rachets up the tension in this bloody but satisfying sequel to 2015's Sicario. Josh Brolin and Benicio Del Toro co-star as CIA anti-heroes stirring a war between cartels on the Mexican border. R. 122m. BROADWAY. WON'T YOU BE MY NEIGHBOR. No gotchas or revelations in this love letter of a documentary about a sweet, gentle man and his message on the transformative power of kindness. PG-13. 94m. BROADWAY. MINOR.